He was born in Auckland, New Zealand on July 20, 1919. A short time after his birth, his family moved south of the city to Tuakau where his father Percival Augustus Hillary bought land. At an early age, Sir Edmund Percival Hillary fell in love with adventures. He attended the Tuakau Primary School and then moved unto the Auckland Grammar School. He was a shy boy and the shyness stayed with him through the years on his way to and from school which was a two hour journey he would fill his time by reading. He had completed primary school early but he struggled in high school. It was during a school trip to Mount Raupehu that sealed his faith of mountain climbing. He went on to study mathematics and science in the University of Auckland and it was in 1993 that he completed his first climb, reaching the summit of Mount Oliver. He became a beekeeper which was a summer job so that he could still do his climbing in the winter. He had joined the RNZAF in 1943, when he was sent to Fiji and the Solomon Islands where he was badly hurt in a boating accident. He returned to New Zealand to live after this. Edmund climbed numerous mountains, some of which were in New Zealand and the Alps. He eventually moved on to the Himalayas where he climbed 11 peaks over 20,000 feet in elevation. In 1953 Hillary moved on to confront Mount Everest. The journey up the mountain was tiresome and fatiguing that only Edmund and fellow climber Sherpa Tenzing Norgay remained on the journey to the top. They managed to reach the top of the 29,035 foot summit at 11:30 am May 29, 1953. 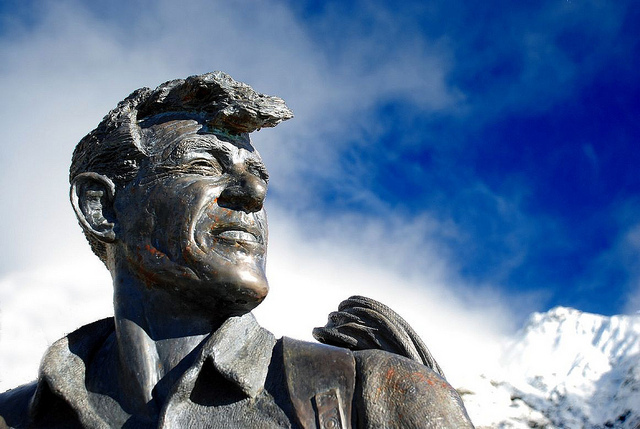 Sir Edmund Hillary was the first non Sherpa to reach the top of the mountain and was crowned by Queen Elizabeth II when he returned seeing as this was a British expedition. He didn’t stop there and continued to climb, mostly in the Himalayas. He now appears on the New Zealand $5 dollar note. Edmund’s shyness had been with him when he wanted to proposed to Louise so he asked his mother-in-law to do it on his behalf. He married Louise Mary Rose after his ascent on September 3, 1953. Peter, Sarah and Belinda who died with their mother Louise in a plane crash were the three children they had together. He remarried to June Mulgrew. His son Peter along with Tenzing Norgay’s son both became mountain climbers and had even climbed Mount Everest on the 50th anniversary of their fathers climb. Edmund died of heart failure on January 1, 2008 at the age of 88. A state funeral was held for him January 22, 2008.